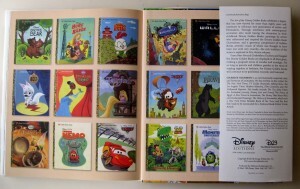 The illustrated hardcover children’s books published by Golden Books are indeed as valuable as gold among collectors — and none more so than the Disney tie-in Golden Books. Now a new hardcover collected edited by animation historian Charles Solomon, The Art of the Disney Golden Books, celebrates these historical treasures — and their lasting value and influence over the past 80 years. “A remarkable lineup of talent, many of whom were Disney Studio artists – including Mary Blair, Alice and Martin Provensen, Gustaf Tenggren, Al Dempster, Retta Scott Worcester, and Bill Peet – created the illustrations for the early Disney Golden Books. The bold and incredibly detailed artwork was painstakingly executed in gouache and watercolor-media that required a steady hand and immense patience and precision. The resulting publications became favorite selections in the libraries of many children, among them, future generations of Disney and Pixar artists who were inspired to draw, dream, and later, create their own films and Golden Books. The Art of the Disney Golden Books celebrates a legacy that has now thrived for more than eighty years and continues to influence new generations of artists and filmmakers. Through interviews with contemporary animators who recall tracing the characters in their childhood Disney Golden Books, paintings by artists who influenced and inspired the Disney Golden Book illustrations, and a generous complement of Golden Book artwork-much of which was thought to have been lost until very recently-the rich tradition of the series is explored in this vibrant volume.” Published by Disney Editions, The Art of the Disney Golden Books is available now from Barnes & Noble.